It is time for a Fab Fast Friday update! This blog series brings you the quick scoop on products I am really loving in my daily routine. These are products that I use and love and you just need to hear about! The cold of Winter is wreaking havoc on my skin...especially my hands. They take a beating. My hands, especially, are dry, rough, and constantly in need of moisturizer. From the cold to frequent hand washing with little kids and flu season. Plus, don't get me started on those anti-bacterial hand gels. They just tear apart my skin! But what is a girl to do? I must kill those germs! The result, clean hands but ragged skin. It is time for me to break out my most heavy-duty moisturizers and hand creams! 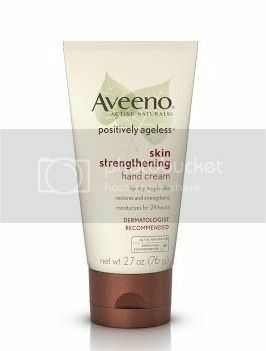 Recently, I have started using Aveeno's Positively Ageless Skin Strengthening Hand Cream and I am completely obsessed with it! I honestly just had this on hand and tossed it into my purse without thinking anything of it. It works so good and it has transformed my skin: from dry, rough, and cracked to smooth and moisturized. This hand cream has such a nice fresh scent! The cream is heavy and thick; yet, it is not overly greasy. It leaves a smooth protective film on your skin which fortifies your skin's protective barrier. This is a good thing. This gives the cream lasting power to fight dryness and protect. Plus, this product contains the ACTIVE NATURALS® Southernwood formula which gives antioxidant protection. This product completely restores my skin on my hands and leaves my hands protected! I feel that regular use of this cream has really transformed my hands and allowed me to maintain a moisture and softness level that I normally can't achieve this time of year with the cold and the frequent use of anti-bac gels and hand washing. Plus, I feel that my nails and cuticles are more moisturized, too: a great plus! I am thrilled to have this product in my skincare arsenal. It is certainly a staple item in my purse! I think I need to add this product by my bedside and at each sink in the house, too. Be sure to check out some of my other Aveeno Favorites here! Sounds like one to remember then! I love Aveeno products esp for the face, ecezma care, and baby products! :) Be safe and warm!